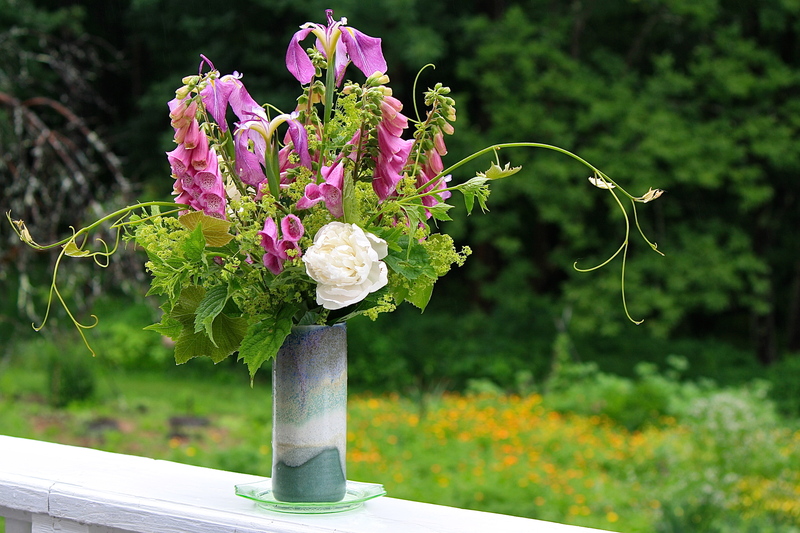 For this week’s vase, I used white and purple foxgloves (Digitalis) and a purple/white Japanese/Siberian/Louisiana? iris that I picked up at a yard sale, so I am uncertain as to its name. A search online has yielded no close identification. If anyone can enlighten me, please do. Regardless, it is still a lovely and prolific addition to my iris collection. You might note I tucked in one of the very last white peony (Paeonia) blossoms. The cool and cloudy weather this week allowed them to linger a bit longer. A full month of voluptuous and scented blooms, who could ask for anything more? Chartreuse blossoms of lady’s mantle (Alchemilla) are a favorite filler flower of mine and tight buds of golden valerian (Patrinia) are used as a green. For added interest, I put in a few tendrils of grape vine (Vitis). I’ve used my favorite vase, a hand thrown pottery gem that I bought in my twenties from a potter in New Hampshire. One of a kind, the artist had moved on to a different technique and she had few of this style left. This entry was posted in Country Gardening, My Photos and tagged flower arrangement, flowers, foxglove, gardening, gardens, golden valerian, grapevine, In a Vase on Monday, meme, patrinia, peonies, photography, Weekly Vase Challenge. Bookmark the permalink. What a lovely, natural boquet! I really like the horizontal extension you accomplished with the grape tendrils, and that vase is WONDERFUL! 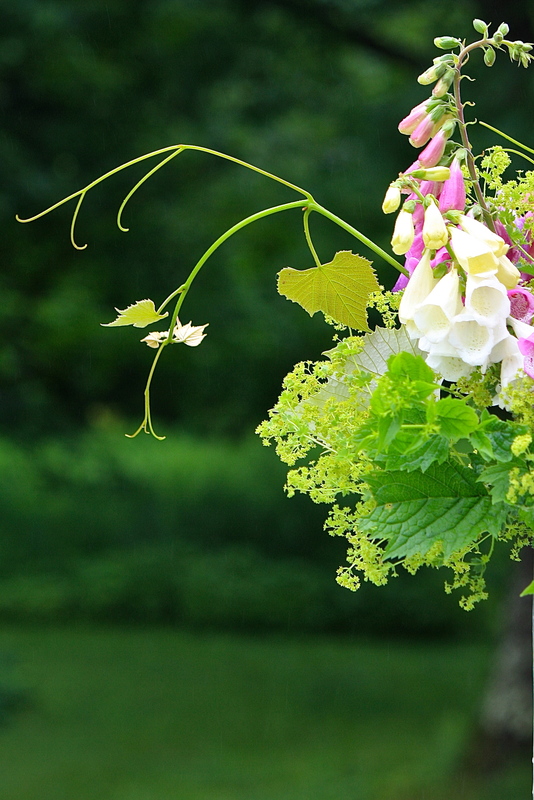 I can see why you love that vase, the vine is an inspired addition to your lovely arrangement. I’m envious of your ‘iris collection’ I lost many of mine during several house moves, just a deep purple one left. That is an interesting iris you have there, I’ve never seen one quite that colour before. Beautiful arrangement, Eliza. Sorry, I can’t help with the iris. Thanks, Derrick. The iris will remain a mystery, I guess, at least until I find an iris expert! The iris is really pretty – quite unusual. And I love the addition of the vine. Alchemilla is perfect for adding to vases isn’t it! I was also able to enjoy my white peony for over four weeks, but the last buds have succumbed to the heat now. The vine tendril is such a great idea – not that I have grapes, but I do have one of the ornamental ones, so that’s something to remember for future vases… The foxglove and iris are perfect bedfellows, and I suppose using your last peony is a fitting tribute to their contribution to your garden. Thanks for sharing. Thanks, Judy. The artist lived in Weare, is that near you? Wow! 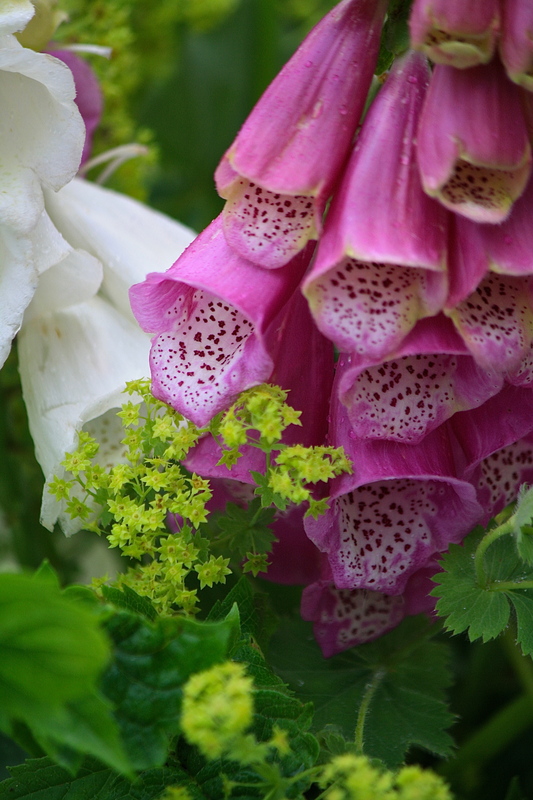 I envy your abundance of foxgloves–so lovely. Hope you find out your iris’s name. Using the tendrils is imaginative. Thank you! Foxglove has self-sown throughout my ‘spring’ garden. It is interesting to see how they cross-pollinate, with blossoms in deep to light purple and plain white, never enough of those! Your peonies were fabulous this year. Sometimes I wish the Maestro could bring all the flowers into glorious bloom together in spring and then keep them there in brilliant crescendo all summer long. A treat for the eyes! Love your taste in vase and flower. I grew beautiful foxglove in Maine but here they just don’t take for me. Must be the soil. 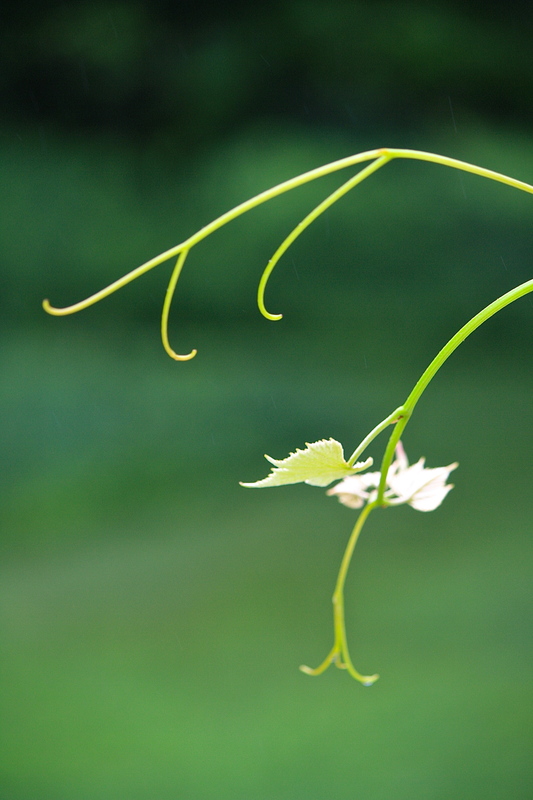 My favorites are the grape tendrils and Lady’s Mantle. I haven’t any idea about the Iris but I’m sure someone will come to your rescue. Thanks, Kathy. 🙂 Perhaps it is a hybrid cross. It a rapid multiplier – it has grown a lot since I got it a few years ago. A mystery plant is always fun to have! 🙂 I sure TRY to live in balance – lol. The pendulum still swings, but I aim to not let it swing too widely. 🙂 Thanks for your visit, Kim! Another beautiful arrangement! 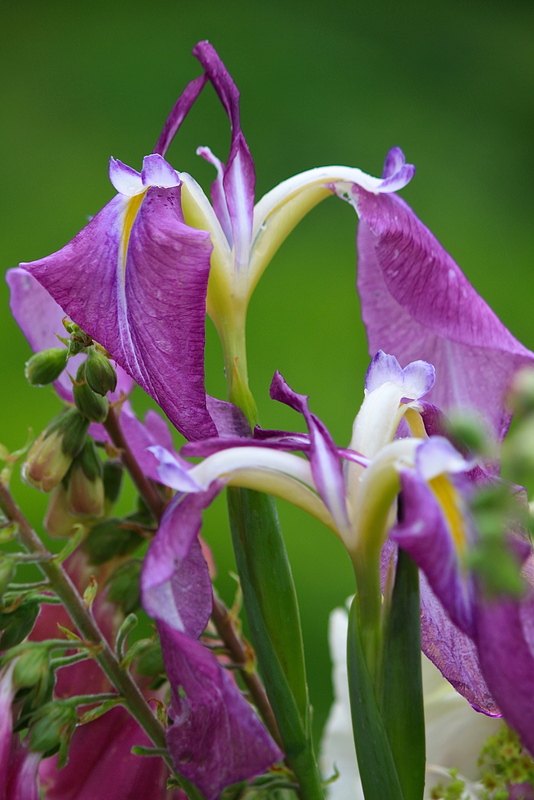 I particularly like the grape tendrils and iris – it is so unusual! (And, of course, the peony – always wonderful). Thank you, Frances, much appreciated! 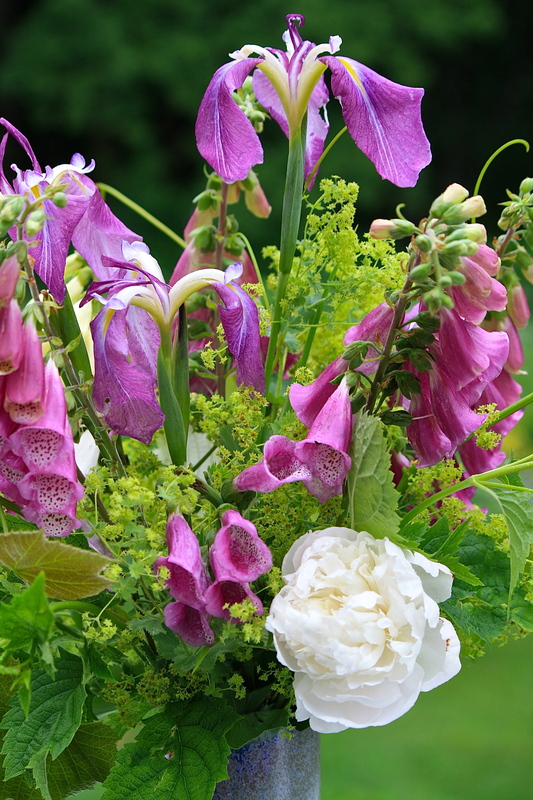 What a fun combo with the iris and foxgloves…and I especially loved the tendrils of grapevine…that really made it just fabulous! I love your arrangements! I bet your garden is absolutely stunning! I so enjoyed looking at your beautiful flowers today and the vase is beautiful. Thank you, Carole, glad you liked it! Thank you very much, Storm. It is my pleasure!